This illustration always reminds me of a very specific scene from an episode of Chris Carter’s “other show”, Millennium. I always – somewhat heretically – liked Millennium better than The X-Files, partly because it has a more mature tone, though I acknowledge that it can be a little too scary for some viewers. Either way, Sensory Deprivation offers a typically blue way of dealing with creatures. In mono-blue, you’re generally either reducing a creature’s power to hopefully make it non-threatening, bouncing it, or paying much more mana than either of the first two effects to steal it. While Sensory Deprivation-style effects do give you an interesting counterplay to abilities like Champion of Lambholt’s evasion, it doesn’t quite have enough impact to be very generally useful, even at a very cheap cost. 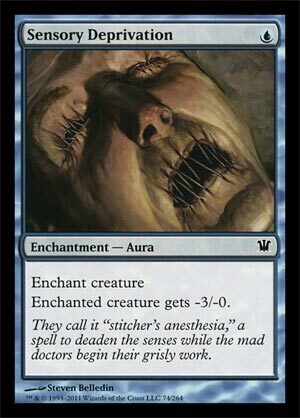 In larger formats, for example, there’s not much difference between using this card and Tightening Coils, which will reduce most creatures to defenders, even ones up to the size of a Titan. It’s also generally a fact that Unsummon effects become more effective as a game goes long and opponents start getting bigger creatures and needing to invest more mana to get them back, the exact opposite of this kind of card. Sensory Deprivation is the kind of blue “removal” it often sees, a way to keep creatures from hitting it while not actually removing it. As a one-mana -3/-0, this does a good job of keeping early creatures in check, as it’s not until you get to the four-drop creatures that you consistently see 4 power on one creature. It’s not great against pump spells and effects (as green often has), and being sorcery speed is a bit of a downer, but it’s a solid Limited card and can be a nice emergency option in Constructed decks if you have nothing else to stop early aggression. But even then, instant-speed cantrips or bounce spells will do this job better.